What is frenulum (connective tissues of tongue, lip and cheek)? Frenulum is a soft mucous membrane which is located between gums tissue and tongue, lips and cheeks and which limits the movement by connecting them to each other. Where is frenulum located inside the mouth? Frenulum is mostly located between upper and lower central incisors, between molars and cheeks, and under the tongue. How many frenula are there inside our mouth? This is a feature which differs from one person to another. In addition to existing under the tongue in almost everyone, multiple frenula exists above upper and lower central incisors and on backside of the cheek area. In which circumstances do frenula pose a risk for dental health? They may cause gum recession and gum diseases by pulling gums down especially when they are larger and thicker than normal and located too close to the edge of the teeth. 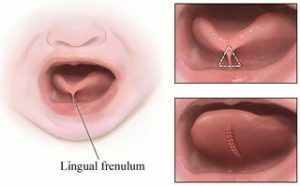 Being larger and thicker than normal, frenulum, which is located under the tongue, may cause speech problems in children.